Bezares is working on a new system for kits for Mercedes G131, G281, G330… and Volvo R1000 / 1700, DT2412C, which will be implemented at the beginning of 2019 and will allow a better management of stocks and, consequently, better delivery times. 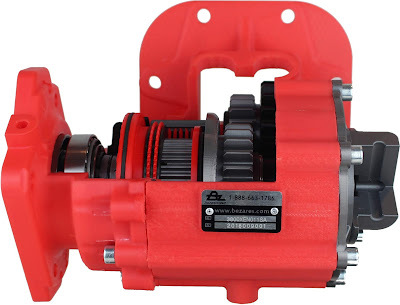 It will be necessary to order the three components to complete the PTO according to your gearbox. The basic PTO will include the equivalent of a ZF S6-90 PTO series, with its corresponding mounting kit. The flange kit will include both the flange and the specific mounting kit for Mercedes or Volvo. The shaft kit completes the PTO configuration in the case of Mercedes or Volvo. Please contact our sales department for further info. Bezares has just finished its first Branch Meeting (BBM2018) with representatives from all our subsidiaries. The event was held from the 16th to the 19th of October, where we have exchanged details and goals of each market to offer the same user experience for all regions with Bezares distribution. Bezares, through its subsidiary in China Bezares Power Transmission, will participate in the Bauma China from November 27 to 30 in Shanghai, China. The world’s second largest trade fair for construction machines after Bauma Munich offers an exhibition space of 300,000 square meters. “The entire area of the Shanghai New International Expo Centre—17 halls and the outdoor area—will again be occupied completely,” Maritta Lepp, bauma CHINA’s Exhibition Director reports. Some exhibitors already asked for larger booth spaces than with the previous edition. The trade show’s high reputation attracts renowned companies from both China and from all over the world. Various countries—including Germany, Italy, Korea, Spain, Turkey and the U.S.—will present themselves with joint stands. The advantages of this central organization: joint booths help especially small and medium-sized companies find cooperation partners and enter this large market. We will be exhibiting at Hall N2 – Stand 560. Bezares has participated in the 67th IAA Commercial Vehicles, the meeting place for the most important industry in the world to present and discuss future solutions for transport, logistics and urban mobility. IAA 2018 was held at the Hannover Fairgrounds from 20 to 27 September 2018, and was organized by VDA. We thank everyone who has visited us and hope to meet you again in the next edition of IAA. Bezares, in collaboration with our partner in Argentina, Alfonso Sabbatini e Hijo S.R.L. exhibited at the Expo Transporte 2018 from September 18 to 21, 2018 in Buenos Aires, Argentina. We thank those who have visited us and we hope to meet you again in the next edition. We are proud to introduce our new line of reinforced power take-off with rotated output, compatible with all the gearboxes for which we offer today 2 pinion power take-offs. The new PTOs with rotated output offers many advantages over previous models as the possibility of using 3 different ratios, better performance in torque and power and a better position for the hydraulic pump, making it more versatile, powerful and economical. The 3 ratios allows to reduce stock and simplify the fleets maintenance, its rotated output helps to avoid possible interference with the vehicle during the hydraulic pump’s assembly and also can offer significant savings over previous models, depending on the model. The new power take-offs are already available for sale in different models of gearboxes from ZF, Volvo, Eaton, Mercedes and others. For more details, contact our Commercial Department. We are proud to announce important improvements in the quality control process of for vane pumps and motors, among them, the new test bench, specially designed for production and laboratory tests in which pressures up to 420 bar and flow rates up tp 450 l/min will be achieved. The new test bench will be equipped with a 202 kW engine and will reach 3000 rpm to satisfy the most demanding tests. A new software will manage in a more efficient way the products’ traceability from the manufacturing and assembly up to the final tests prior to its distribution, allowing to issue personalized quality certificates according to the client’s requirements. This test bench is part of Bezares’ machinery investment group for the development of its new T7 range of high pressure vane pumps with 320 bar of continuous work maximum pressures. In addition, when working in parallel with the current test benchs, will reduce the testing times, and consequently, delivery times. Bezares will participate in the International Agricultural Machinery Fair (FIMA) 2018, which will take place at the Feria de Zaragoza facilities from 20 to 24 February 2018. We will present our latest releases as well as our TDZ product line for the agricultural sector, where the last generation machinery linked to this sector will become the undisputed protagonist. In its 40th edition, the International Fair of Agricultural Machinery 2018 already exceeds the surface and the number of brands of 2016, when it counted on 1,357 signatures and 150,000 square meters of surface. Undoubtedly, the 40th edition of the International Fair of Agricultural Machinery will be the largest and highest quality. FIMA is consolidated as the largest agricultural event in Spain and one of the main references in Europe. Continuing our goal of continuous improvement of our products, quality control and production processes, Bezares incorporates the new DT600 3d printer from DynamicalTool. The DynamicalTool DT600 printer offers a professional 3D printing system of last generation, with 2 independent heads, precision mechanics and different work materials, thus offering a precision and speed of printing quite superior to the system previously used. This printer supposes the simplification of the work of development and tests, in addition to an important technological advance, when incorporating the additive manufacturing in combination with the traditional manufacture thanks to the range of working materials that it offers, accelerating thus the process of development and tests.